Are you ready, dear readers? It’s time to pretend anyone agrees on what ‘avant garde’ means, just like we do every season! The Challenge: Finally, the challenge that determines who will “go” to Fashion Week! (Except that it’s common knowledge that all the remaining designers and a handful more already showed at Fashion Week. I can’t believe that after twelve seasons, we’re still forced to pretend that only the designers whose collections are televised make it to Fashion Week.) The designers are sent to a butterfly house on Long Island to look at pretty insects and promote L’Oreal’s Butterfly mascara. They are given two days to create an “avant garde” look inspired by the butterflies, except that almost everyone involved in this show neither knows nor cares what avant garde means. I have complained about this for so many consecutive seasons, it’s almost become hilarious. Almost. On what was supposed to be the runway day, Tim announces a new “Make it Work challenge” – the designers have to choose a look that was previously eliminated and transform it into a winning look, without changing it so much that it wouldn’t look like it came from the original. What a grand old waste of time this addition to this challenge was – it took away all the creative design aspects of the challenge (“Edit someone else’s work! Don’t change it enough to actually make it your own!) and took time away from the avant garde looks, which desperately needed every moment of the designers’ attention. Guest Judge: Emmy Rossum, who looked so much like Rachel Bilson that I had to do a double-take every time she was on the screen. But she was sweet and enthusiastic and game to try on the crazy coat Dom created, so that was actually quite fun. Ethereal and mystical and dark and creepy and beautiful. Not particularly avant garde, but more interesting than half the so-called fashion on the runway. But I’d like to call BS on the judges who felt that Alexandria did not have a distinct point of view – almost everything she’s made has had this distressed, gothic-tinged, urban-hip aesthetic to it, and it’s a much more clear point of view than virtually any of the remaining designers, with the exception of Dom. I thought this dress was interesting enough to avoid elimination, but avant garde? Not so much. It’s not for everyone, but it’s a pretty great transformation of the original. And the old fart judges don’t know anything about modern street style if they think this isn’t wearable or of-the-moment – it’s not for everyone, that’s for sure, but this is pure Cara Delevingne traipsing down the streets of London. And that’s a look, even if it’s not a look the judges are necessarily familiar with. It was brilliant and thoughtful and fabulously executed. It was head and shoulders better than what Justin, Alexandria, and Helen created. But this actually felt kind of expected to me; this is exactly what comes to mind when you think of “avant garde.” But if avant garde is supposed to surprise, even shock us, you should never design something that is stereotypically avant garde. By nature of it being expected, or a copy of something else, it’s no longer avant garde! And this is why trying to squeeze avant garde into a Lifetime television show will never, ever work. Anyway, I’m not saying I didn’t love this, because I did. I just felt that Dom’s work was more original and therefore more deserving of the win. Cute enough, but overpraised and a tad boring. By far my favorite look of this entire season. I could not have anticipated that something like this would come down the runway – that element of surprise, to me, makes it the most avant garde out of all this episode’s looks. This ensemble actually had a surprising amount of function or wearability, but those aspects didn’t take away from the avant garde feel of the look. And as per usual, the styling is brilliant. I’ve been Team Dom since this season began, and that feeling has grown exponentially since then. I think she’s much more talented and has a more youthful, exciting point of view than anyone else in the competition. But I’ve thought that about most of the young black female designers who have made it to the season finale over the past twelve seasons, and none of them have ever been awarded the win from the judging panel of middle-aged white people. So what I’m saying is, I’m rooting for Dom, but I’m not getting my hopes up that the judges will put down their crack pipes long enough to give her the win she deserves. Dom took Jeremy’s look from politician’s wife to fierce urban hipster fabness. Not an easy feat. Helen would have gotten the auf from me the moment this hit the runway. This is one of the least avant garde things I’ve ever seen – Heidi herself said that she thought Helen could sell tons of these dresses. That commercial marketability is exactly what makes this a losing look for an avant garde challenge. She also used a technique we’ve seen billions of times, from Helen and from much more talented designers, so if she expected me to drool over her construction abilities, she’s sorely mistaken. And the only interesting thing about this look is the color, which is interesting in the bad way. Adding triangular hair to a boring red carpet gown in a dramatic but hideous color does not an avant garde look make. But having to listen to the judges pretend that this was avant garde added insult to injury. It’s fine. It’s whatever. Her model couldn’t even walk in this goddamn skirt. Shockingly, the most boring designer of the bunch managed to make something that was at least marginally more avant garde than Helen’s look. (But then again, a pair of jeans and a white tee shirt are more avant garde than Helen’s look. And Justin’s is still pretty far from avant garde) I actually think the coat he made was beautiful, but it’s all pretty standard, romantic fare. Justin was brilliant to choose his own look to transform – he knows the judges and the producers love a redemption story more than anything else on earth. And if he could transform something that got him eliminated into something marginally less hideous, the judges would never be able to eliminate him again. Sadly, this completely obvious move worked on our crack-addicted judging panel, who decided to send NO ONE home because of how utterly brilliant and avant garde and transformative all these designers are. I call your BS, Heidi & Co. Justin and Helen have no business still being in this competition – and some will argue the same is true for Alexandria, though I think she’s got potential. Oh, and eliminating Alexander right before the avant garde challenge was just mean. He would have rocked this challenge like no one else, and given us something brilliantly surprising to discuss, instead of the boring parade of red carpet gowns we were subjected to. Judges’ Bottom 3: Nobody, because this show is awful. When they announced it was the avant garde challenge and they had two days, I thought: whoops! Don’t believe it. Get your look done the first day because they WILL throw in a twist. Granny sometimes gets a little grumpy here when the designers are all shiny-eyed and eager and stupid. Alexandra’s was a reworking of Miss Havisham, IMO. All she needed was a spiderweb. 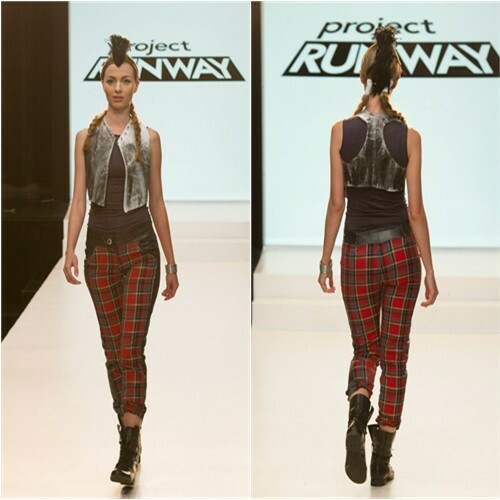 And her reworking of the plaid pant look was something even I have seen before. Braden’s look was new and exciting. It’s completely unwearable by anybody of normal proportions, but it is the avant garde challenge so why not? I loved Dom’s use of exuberant prints. She has a real eye for color and proportion. I kind of liked Justin’s- which means it couldn’t have been avant garde- it reminded me of an outfit I had for my Barbie when I was small- and he was smart to pick the dress that got him kicked off to rework because they’d never have done that again. Helen showed no originality in her reworking of Kate’s outfit. She essentially made what she’d made for her Hewlett Packard Print challenge, only whereas the print challenge two-piece look had a vague Indian (as in India) vibe, this just looked tired. 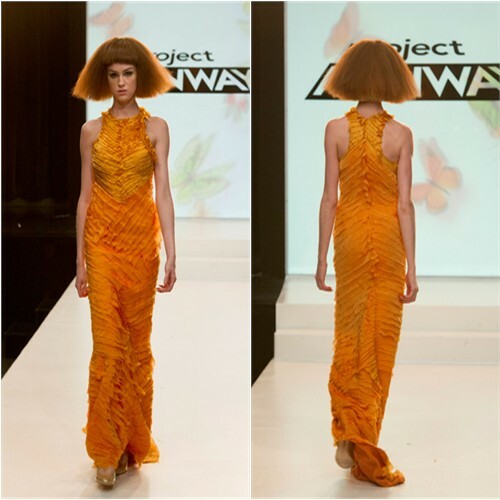 When I saw the golden apricot shredded dress, I thought of Gordana’s grey dress in season 6. We have seen that look so often. I will say that personally, I loved the color. It would be trying for most women to wear, especially someone with my pink-and-white complexion, but with the right skin tone it would be fabulous. The color, I mean, not the dress. I suspect the judges just didn’t want Helen of Tears, self-proclaimed badass, to sob her way off the runway. Best Moments: Justin in the butterfly pen, clutching his sketchbook and unaware of the butterfly parked on his head. And at Mood, when we saw Swatch in closeup with one ear up. I like it when they check in on Swatch: he’s getting older, you know! First of all, I am always on Swatch Watch. They did give him a particularly good close-up this episode – I noticed that! As a fellow pink-and-white lady, I couldn’t pull off the color of Helen’s dress either, but I agree it could be fantastic on the right skin color. But it was all wrong for her model. Adding: the judges had to be smoking something to announce that Helen’s reworking of Kate’s look was something that “could be worn to a meeting.” Meeting whom? It sure couldn’t have been worn to a business meeting. Helen did a copy of christopher palu technic for her dress. How did they not mention that at all. She knew how much the judges loved that technic and used it again because as we all know she doesn’t have any tricks or ideas she can pull out of her A$$. Don’t understand why she is still in the competition and at least half her wins were under deserving of the wins she got.